members to professional athletes, avid Grenade users rave about the results both as a weight management system and pre workout energizer. When used synergistically with a sensible diet and exercise programme, Grenade can increase your energy levels, mobilize fat and help you achieve the body you have always desired. Grenade combines the highest quality, maximum potency ingredients to help support a metabolic rate and a level of appetite that could naturally support fat metabolism and weight management. 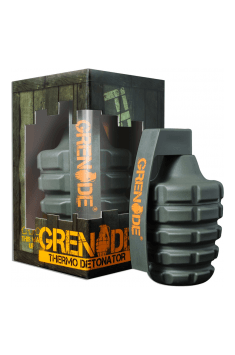 With a massive 500mg of Green Tea extract per serving, Grenade packs just about the biggest punch in the industry with regard to this proven ingredient. Carefully processed green tea extracts contain specific levels of molecules called “catechins” – these are chemical polyphenols that have been shown to have positive effects on body weight and measurements and to have strong antioxidant and health-supportive properties. Of particular interest is the catechin “epigallocatechin gallate”, which has been extensively clinically studied in several scientific studies and is probably the most important legal, natural molecule in the war on fat! Again, not scrimping on expensive, high-quality ingredients, Grenade delivers the highest Bitter Orange Peel levels of any major weight management product on the market! Why only use a sprinkling of effective ingredients, when you can deliver the goods with a proper dose? A full 420mg of Bitter Orange – also known as Citrus Aurantium, which naturally contains synephrine and octopamine – has been deployed. Most people who’ve been around the block know that this stuff packs a punch! Specifically, synephrine and octopamine have subtle effects on the hormone norepinephrine (among others) and this is believed to be the body’s most important hormone in support of fat oxidation (using fat for energy). Caffeine Anhydrous has also been added, for its well-known ability to liberate fat from fat cells, further allowing its use as energy. Cayenne is a specific form of hot pepper extract, which has a well-known and researched effect on the feeling of heat production in the body and the essential amino acid phenylalanine is added as it may support thyroid function to maintain metabolic activity. Finally, Green Coffee, due to its unique cross section of active constituents such as chlorogenic acid, could also support the weight management process. 1 capsule in the morning before breakfast and 1-2 capsules before a workout. Do not exceed 4 capsules in portions during the day. Use up to 8 weeks, then take a break. Do not exceed 4 capsules per day. GRENADE - This is one of the fastest growing and most innovative companies in sports. It has products for both men and women, professional athletes and fitness enthusiasts. The products of GRENADE are: supplements burning calories, increasing metabolism, improving concentration. They are used by special forces in many countries.